Share your joy with loved ones far and near with adorable Easter cards featuring charming designs. 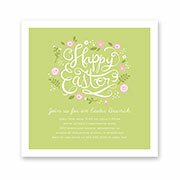 Get ready for the big brunch or egg hunt with Spring-chic Easter invitations. Celebrate Easter with everyone on your list this year. Send your family and friends festive Easter cards or personalize a special note to each of them on stationery from Shutterfly. Your loved ones will be delighted when they see a little something from you in the mailbox this year. Since Easter happens during the spring, it is the perfect holiday to celebrate new beginnings and for friends and family to spend time together. 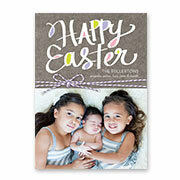 At Shutterfly, we can help you design those special, one-of-a-kind Easter cards, invitations and gifts. Plan the perfect Easter celebration and invite your loved ones to a wonderful holiday brunch or dinner with personalized Easter invitations. From stunning invitations to thank you cards, notepads and stationery, there are endless charming options. Make a statement and add a little flair to your invites with customized address labels. This is the perfect way to put your own unique stamp on the invitations. Your family and friends will open their mail and hop on over for Easter dinner. Create an extra-special ambiance for dinner with exquisite serving trays and stylish glass plates. Customize your home décor gifts by choosing from our selection of patterns or by uploading your own design and favorite family photos. Keep it simple with a monogrammed tray or make a big splash with a picture collage layout. Use your unique dishes for dinner or give them as an Easter gift. There you have it. Whether you’re looking for Easter greeting cards to send to your friends and family, unique gifts for the holiday or the perfect Easter invitations to bring the whole family together, Shutterfly has choices galore. Spring has cracked open, and so have the fanciful eggs in this charming Easter invitation. Two hold sweet, eager chicks, while another holds an adorable pink-eared bunny.